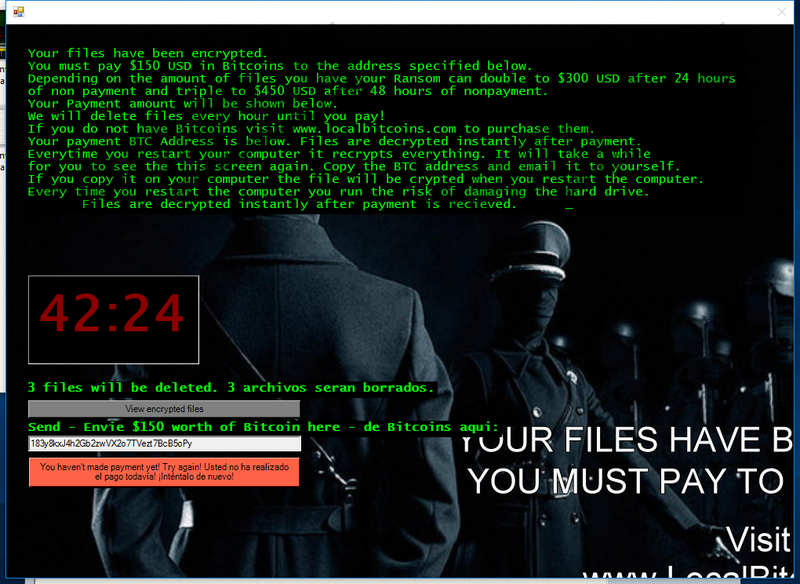 Invisible Empire Ransomware is a Trojan infection that enters systems without permission and then locks all the files. It has been found that this infection encrypts music files, pictures, videos, and other important files in all the directories, including those that are located on Desktop and in %PROGRAMFILES% (%PROGRAMFILES(x86)%), %WINDIR%, and %TEMP% directories. Researchers at pcthreat.com have not found this surprising because Invisible Empire Ransomware is just a new version of Jigsaw Ransomware, which was prevalent on the web a while ago. Of course, this Trojan acts the way it does not without a reason. Like other similar threats, it seeks to extort money from users. We do not think that paying money to cyber crooks is the best decision because you might lose your money and do not get anything in exchange. Also, you should know that a free tool for unlocking files exists. You can only use it if you remove Invisible Empire Ransomware from your computer, so make sure you do that as soon as possible. You must pay $150 USD in Bitcoins to the address specified below. of non payment and triple to $450 USD after 48 hours of nonpayment. Your Payment amount will be shown below. We will delete files every hour until you pay! As can be seen from the excerpt, the key to decrypt files is quite expensive; however, if you decide to transfer money to cyber criminals, you should do that right now because the ransom will double and even triple after some time. Besides, 3 files will be deleted every hour, and it will not be possible to bring them back. Of course, security specialists at pcthreat.com do not recommend paying money to cyber criminals because they know that there is a possibility that you will not get the decryption key. To be honest, you do not even need it because the free decryptor, which you can download from the Internet, still works. Do not forget that you need to remove Invisible Empire Ransomware from your computer first because it might encrypt the tool for decrypting files as well. Researchers say that you can also recover files from a backup after the deletion of the ransomware. Of course, this will not work for you if you have never backed up your files. In order to start with the Windows OS, this ransomware infection creates the Value in HKCU\Software\Microsoft\Windows\CurrentVersion\Run. In addition, you will be able to detect several new files in %APPDATA%. As you can see, Invisible Empire Ransomware is a serious computer infection that not only creates new files on the infected computer, but also modifies the system registry. Unfortunately, other ransomware infections act in a similar manner, so we suggest being very careful all the time. You should especially be careful on file-sharing and torrent websites. Also, you should never open spam emails because ransomware infections are often distributed as spam email attachments. To ensure the system’s safety, you should also install security software on your computer. Invisible Empire Ransomware can be removed from the system manually, and we do not think that this will be very difficult for you because you can use the manual removal instructions (see below) we have provided for you. Do not forget that you will have to drag the window to the side in order to access the Registry Editor or Windows Explorer. Do not forget to scan the system with SpyHunter after you get rid of the ransomware in order to eliminate all other existing threats and thus clean the system. Of course, you can use an automatic tool to delete Invisible Empire Ransomware from your system as well if you find the manual method too complicated. All you need to do is to download the tool, install it, and launch the scanner. Enter regedit.exe and click OK.
Right-click on wrkms.exe Value and select Delete. Open the Windows Explorer and enter %APPDATA% into the address bar. Delete these folders: Wrkms and System32Work. Go to %LOCALAPPDATA%, right-click on Systmd, and select Delete. Go to %UserProfile%\Local Settings\Application Data (if you use Windows XP), locate Systmd, and delete it. Quick & tested solution for Invisible Empire Ransomware removal.